Recently I’ve been working a little bit with Microsoft Office SharePoint Server 2007. It is recommended that Internet Explorer is used to interact with this web based system as it provides the widest and tightest integration and range of features. Unfortunately I have a strong preference for Mozilla Firefox over Internet Explorer. However there’s a nice add-on for Firefox that helps me get round the annoyance of having to have two browsers open – IE Tab. Whilst it is still fundamentally using Internet Explorer, it allows me to set sites to automatically load into a Firefox tab and render a page using the Internet Explorer ‘engine’. One browser window and no need to remember when to open another browser. Unfortunately SharePoint seems to play poorly sometimes. Whilst still fundamentally working I was getting a lot of problems accessing my ‘My Site’ and occasional problems in other areas. I was plagued by dialog boxes asking me if I would like to debug when trying to move the mouse pointer to click on a link. So much so that it just seemed to be unusable. This seems to be a known issue (and looks like it falls back to some poor SharePoint coding), and Microsoft recommend simply turning off the warnings by setting an option in Internet Explorer. Far from ideal, but it’s not like I can fix the problems for them. To set this, open Internet Explorer, select the tools menu and Internet options… . 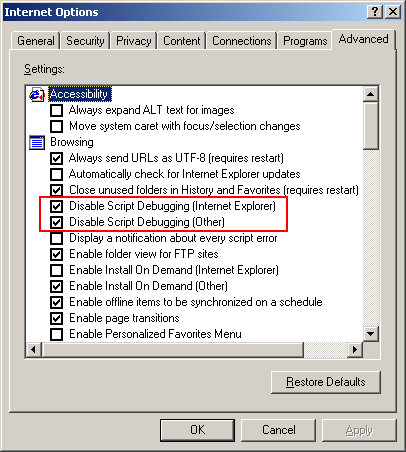 Select the Advanced tab and in the browsing section select the “Disable Screen Debugging (Internet Explorer)” option. Unfortunately the debug messages continue to appear, but they don’t appear in Internet Explorer when it is run outside of Firefox. I double checked and without this option set Internet Explorer did experience the same issues. The resolution to the IE Tab in Firefox is however close to hand. It seems odd at first that the disable option explicitly mentions Internet Explorer. After all what else would you set an option for…? Well it looks like there’s a separate option for anything using the Internet Explorer rendering engine outside of the main browser … such as IE Tab. The option is “Disable Screen Debugging (Other)” and it works like a charm. So until Microsoft sort out their SharePoint warnings and for all those IE Tab users out there who need to use SharePoint I’d recommend popping into Internet Explorer and setting the script debugging options.